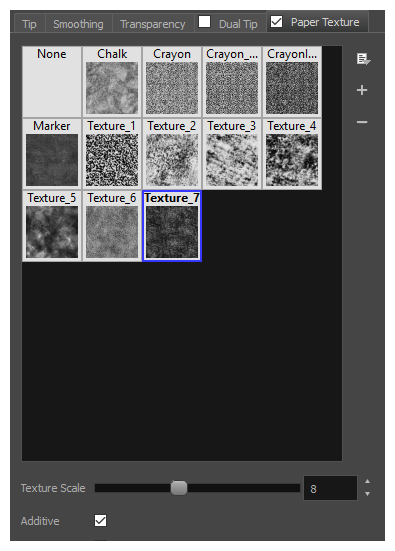 In the Brush Properties dialog, you will find a set of default paper textures which are bundled with Harmony, but you can also create your own paper textures, then export your collection or import an existing set. To make your own paper texture, you must first create an image file containing the texture, either in Harmony or in a third party software, like Adobe Photoshop, then import it into Harmony. A paper texture must be a greyscale image. Colors in paper textures are not acknowledged by Harmony, as paper textures are applied onto the colour you are painting with in Harmony. Your texture should also not contain transparency, as Harmony determines the texture's transparency based on its black, white and grey levels. When drawing with a paper texture, its black parts will appear 100% opaque, its white parts will appear 100% transparents, and its grey parts will appear semitransparent. You can import brush tips in any image format supported by Harmony. It is recommended to create paper textures in a resolution ranging from 100 x 100 pixels to 400 x 400 pixels. Like brush tips and brush presets, paper textures are saved in your preferences. You can also export your paper textures into an .xml file, and import them on a different workstation, allowing you to share your textures between the different people collaborating on your project. From the Paper Texture menu, select Add.